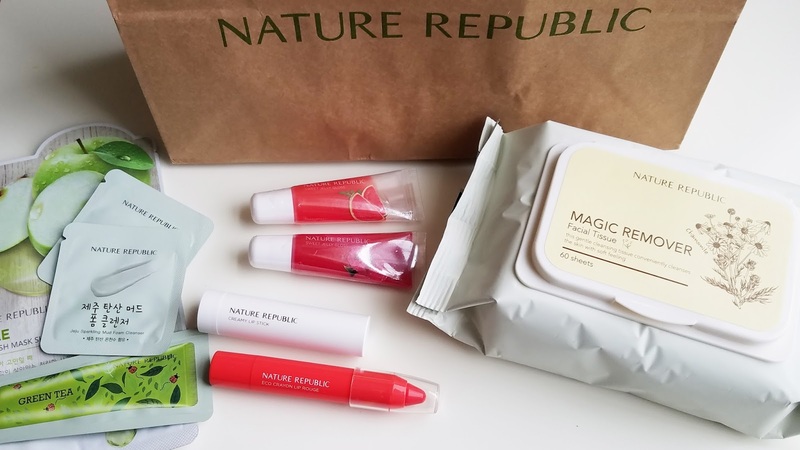 I'm backkkk with a Korean Beauty Haul, my first time purchasing from Nature Republic. 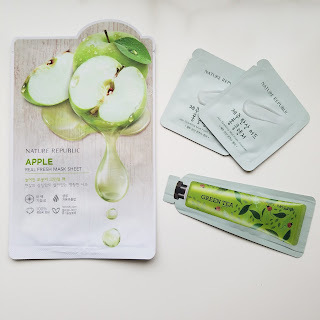 I recently found out that there's a Nature Republic store not too far from where I live. My sister was the one to introduce me to this Korean beauty brand. She had let me try out her sweet jelly lip gloss, which I really liked. So I jumped at the opportunity and went shopping for the first time! I wanted to try these products out because all of Nature Republic's products use all natural ingredients. I had a really memorable first time experience at Nature Republic. The customer service was great! The sales associate (I apologize because I totally forgot her name) was extremely helpful with picking out the right lip product and lip color that I want. I also got to try out the testers in the store, which was very nice because I get to try out the consistency of the lipsticks, lip crayons, and lip glosses! Nature Republic products are reasonably priced, especially since they're not a brand from the U.S. I thought they were going to be expensive due to the import taxes and such, but nope! Some of these products are cheaper than US products! 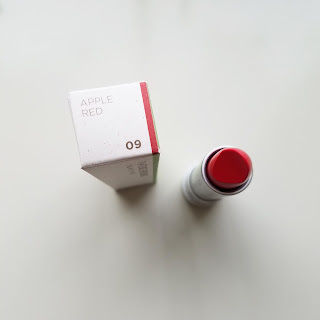 Nature Republic Creamy Lipstick #9 in "Apple Red"
Nature Republic Eco Crayon Lip Rouge #3 in "Peach Coral"
This lip crayon is very moisturizing and has a coral tint to it. It is more on the sheer side but you can build it up to make it more opaque. 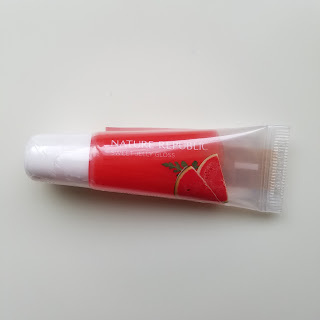 Nature Republic Sweet Jelly Gloss #5 in "Watermelon"
This gloss looks great when paired with a lipstick! It is tinted so it will change the color of your lipstick, but I find myself loving the outcome of mixing the two colors. 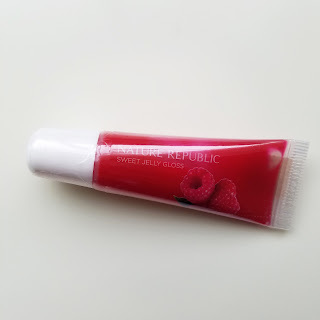 Nature Republic Sweet Jelly Gloss #6 in "Berry"
This gloss also looks great when paired with a lipstick! It is tinted so it will change the color of your lipstick, but I find myself loving the outcome of mixing the two colors. 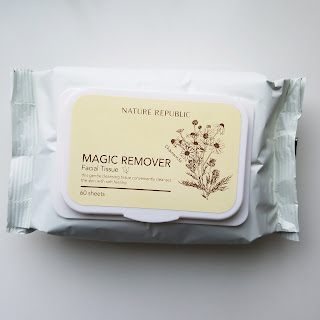 I loveee these makeup removing wipes! I found these wipes in the store and I was just going to remove the lip product swatches off my hand. I had no intentions of buying them, but then and there, I instantly fell in love with these! 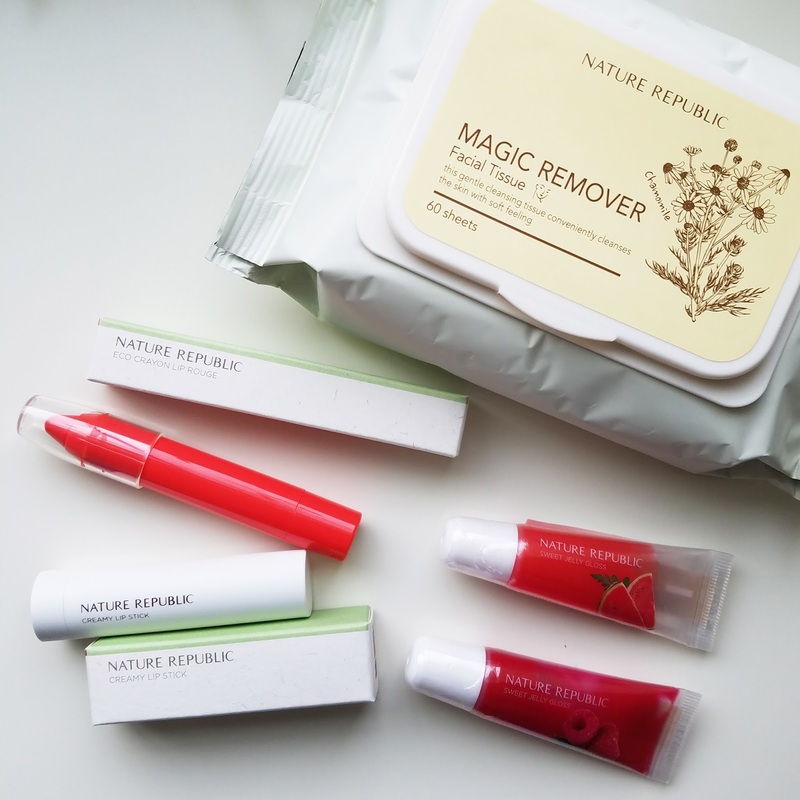 Literally almost everything came off, except the super long-lasting lip stains (no product will instantly remove these btw). The wipe left my hand feeling so soft and smooth, and they felt really gentle on the skin. 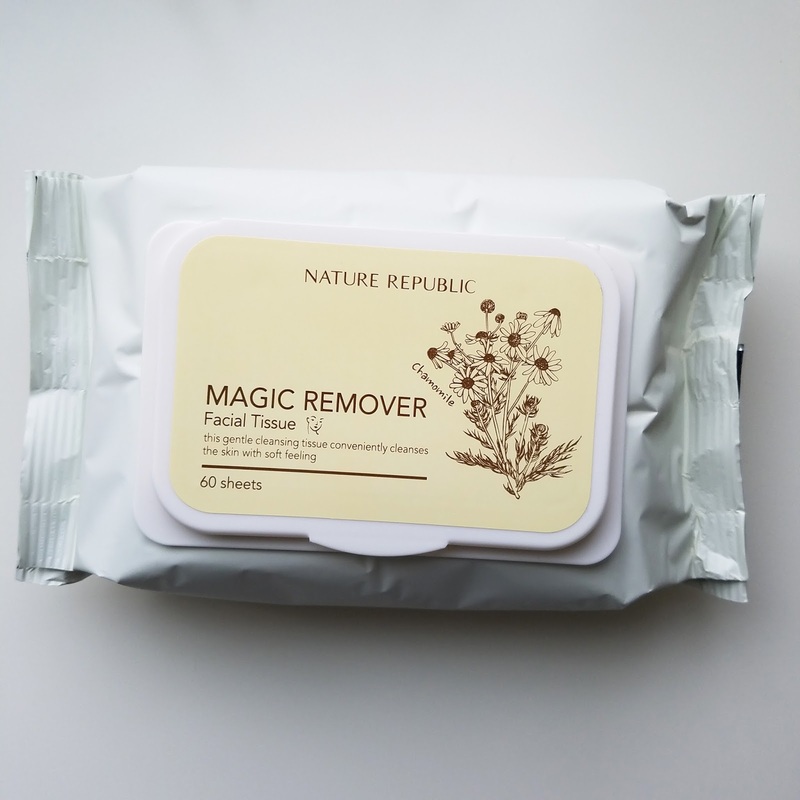 They used natural ingredients to make these wipes so that people with sensitive skin can use them. I liked it so much that I snatched a pack to try on my face later that night. Let me tell you, it was life changing! One wipe will take EVERYTHING off and they do not leave your face feeling greasy. Yes, my makeup glides off with a gentle wipe, not to mention how clean my face feels afterwards. Just so you know, I've tried the Neutrogena makeup removing wipes and didn't really enjoy how harsh it was on my skin, not to mention that it didn't remove all of my makeup. I had to wipe really hard for my makeup to come off, but as a result, my skin is irritated from the harsh wiping. The Neutrogena wipes left my face feeling kinda greasy and I felt like there were still makeup residue on my face. A box of 25 Neutrogena wipes are about $6.50 and a refill pack is about $5. Now please compare it to the 60 sheets Nature Republic wipes for $8... That's a DEAL! 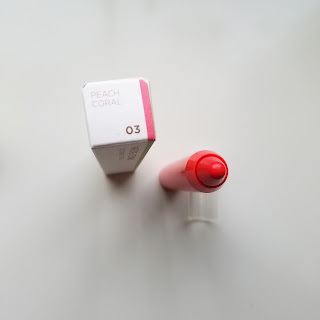 That's it for my Korean beauty haul. I hope you enjoyed this post and find it somewhat helpful. Thanks for stopping by, I'll see you next time! I'm back at it again today with 3 DIY denim choker necklaces tutorial! 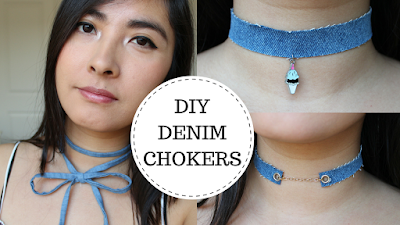 These DIY chokers are inexpensive and very easy to make. They also look great when paired with many different outfits. Comment below & let me know which DIY choker necklace is your favorite! 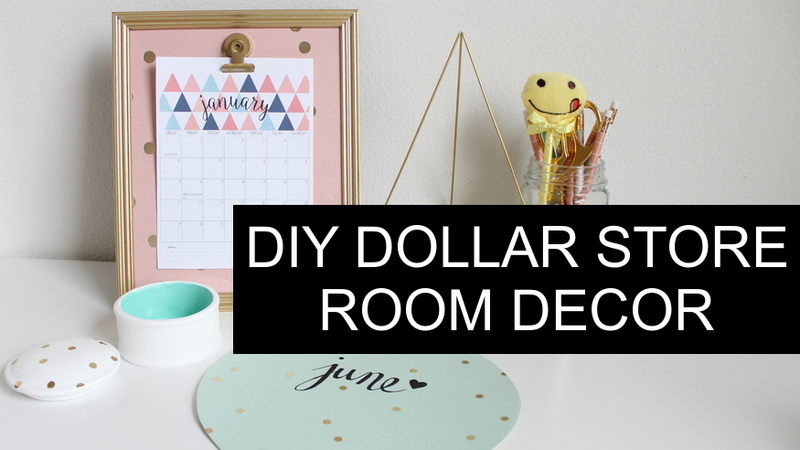 This is Part 2 of the DIY Dollar Tree/Dollar Store Room Decor tutorial! Today we'll be making some Tumblr inspired DIY room decor pieces: DIY coasters, DIY picture frame & DIY jewelry holder plate! These DIY Dollar Tree room decor projects are super easy and affordable, and everything was from the Dollar Tree! 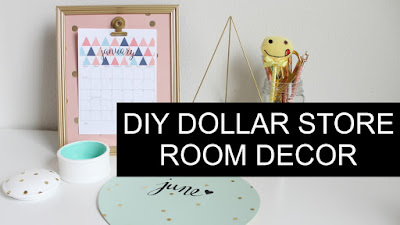 I hope you like this DIY Dollar Tree room decor tutorial Please snap a photo if you re-create any of these DIY room decor ideas, and please share it with me through Facebook, Twitter or Instagram. 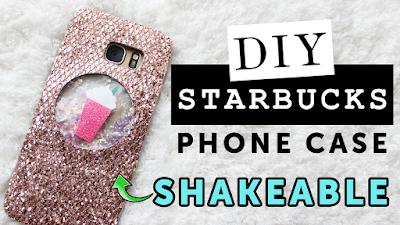 I would love to feature your DIY in my next video! Thanks! Check out Part 1 of the DIY Dollar Tree Room Decor. Thanks for stopping by, I'll see you next time! Happy New Year! This is my first DIY project for the new year, which is a DIY Dollar Tree/Dollar Store Room Decor tutorial. We'll be making 3 Tumblr inspired DIY room decor pieces: DIY calendar, jewelry box & mousepad! These DIY projects are super easy and affordable. I purchased everything from the Dollar Tree, with the exception of the tools that I used, as well as the stock paper (you can use colored construction paper instead). Note: The acrylic sealer made the gold foil bled onto the white paint. I recommend using Mod Podge instead. It dries clear and the foil will show up nicely. I hope you like this DIY Dollar Tree room decor. Please snap a photo if you re-create any of these DIY room decor ideas, and please share it with me through Facebook, Twitter or Instagram. I would love to feature your DIY in my next video!